It’s here folks! 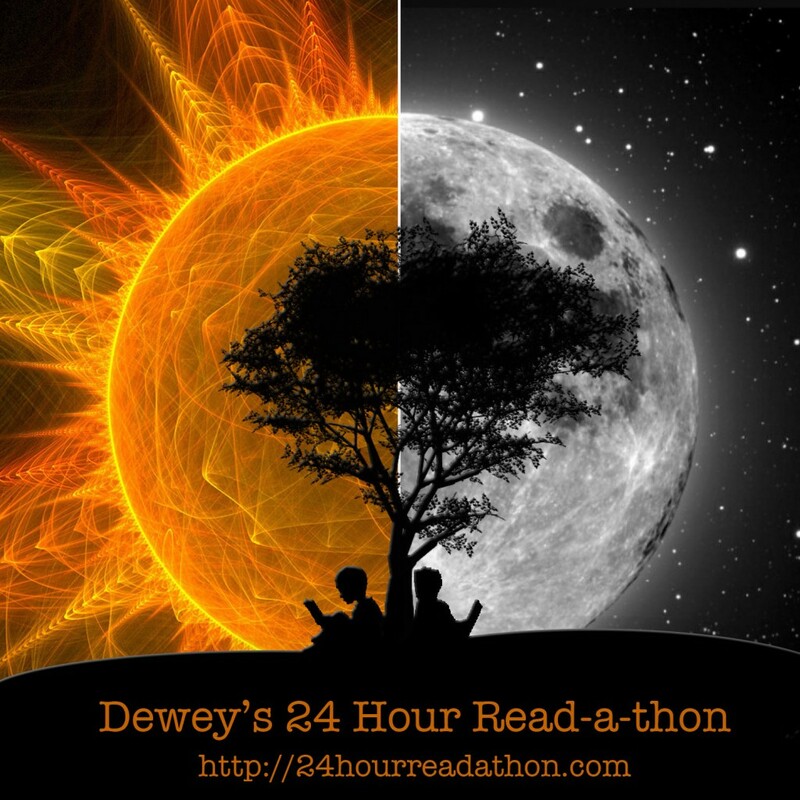 Dewey’s 24-Hour Read-a-thon! When Dewey started this event, who knew that this event would still be going on strong years later? I hope Dewey is someplace reading with us. I know she would be cheering on all the participants who’ve decided to read some Neil Gaiman, one of her favorite authors. Dewey, you are truly missed. If you don’t know, the read-a-thon is a day dedicated to reading. It’s not a contest of some sort. We’re all busy and are juggling many roles in our lives. The read-a-thon is a way for readers around the world to relax, sit back, and do something they love: read. Black Jack – Charles R. Smith Jr. 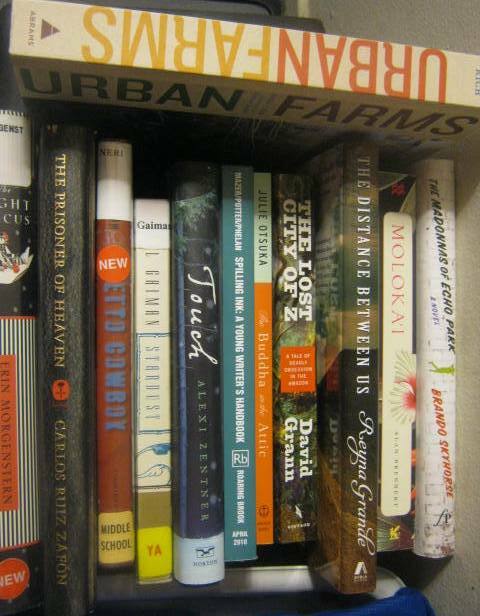 I am not trying to read all of these books in 24 hours; I just like having a huge selection to choose from. The read-a-thon is always a family event but this time, most of the members of my family are joining in including my kids and my sister. I’ve just finished cleaning my house and now there are read-a-thon stacks everywhere! I don’t mind though. We’re up! The kids have already started reading and even my mom is joining us by reading to my youngest. Granola bars have been eaten and coffee is perking now. 2) Which book is your stack are you most looking forward to? That’s a really hard question. Maybe The Night Circus or Stardust. 3) What snack are you most looking forward to? That’s easy Shrimp Fried Rice this afternoon! 4) Tell us a little about yourself. I keep changing my major. I’m currently an anthropology/psychology major but right now I’m acting like psychology doesn’t exist. If I could choose one superpower to have, I would probably cheat and choose three: super strength, the ability to fly, and I wouldn’t mind the power of persuasion. Plus, I’m a mother of three. 5) If you participated in the read-a-thon last time, what would you do differently now? Nothing! I will be updating this post throughout the day with everyone’s progress. Are you read-a-thoning this weekend? We’re seven hours in and I’ve only finished one book: Only a Witch Can Fly by Alison McGhee with my youngest. It’s a good thing everyone else in the house can’t say the same. They’ve been reading up a storm while also eating a ton of food. I would have taken pictures of everything we had but didn’t think about it until after our plates were empty! 1. How are you doing? Sleepy? Are your eyes tired? A little. I’ve been up since 2 this morning because of insomnia. 2. What have you finished reading? How Children Succeed by Paul Tough. It was a really good book. I need to reread it before I review it. Do you see all the post-its? 4. What about your favorite snacks? Can I count coffee? I took a mini-break and picked up some cupcakes for later. 5. Have you found any new blogs through the read-a-thon? I’ve found a lot of great blogs. Probably every blog I’ve visited so far today (40+), I want to visit again. The kids are watching Hocus Pocus, a great Halloween movie. 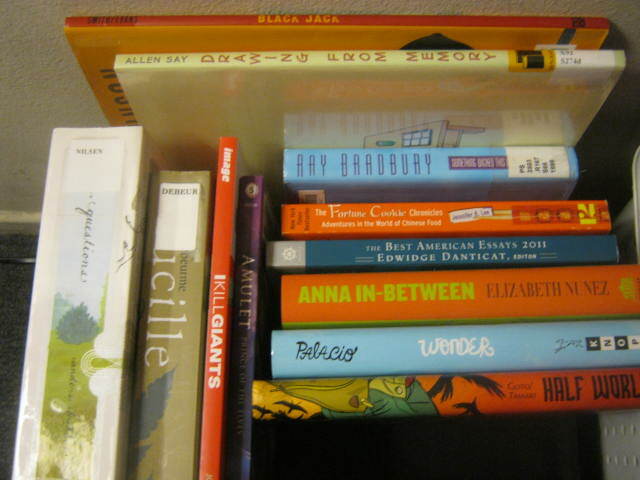 So now is a good time to read something spooky and fit in some picture books. You are ready! Have fun! Y’all are off to a great start, Vasilly!!! So excited that your fam is joining in. Have a blast! Happy Readathon! Hope it’s going well for you and your family!!! Must be so fun to have everyone involved. I feel like I’m stealing time to check in and cheer… I had to laugh and agree that it is not a competition. I recall the first time I told aomeone abt readathon and they wanted to know if people cheat and say they are reading more pages than they really are. it had never occurred to me to wonder that!!! I just finished reading Night Circus for my Fantasy Book group. It’s absolutely lovely. I’m starting my read-a-thon with rereads of Octavia Butler’s Parable books. It’s comforting to re-read isnt it?…even if the book in question is depressing. So many great books there! I’ve been thinking about a Stardust reread soon too what with the beautiful new edition coming out and all. Have a fantastic day! I read The Night Circus recently and really enjoyed it. Happy read-a-thon-ing! Hope you are enjoying your reading! It sounds like you will have plenty to talk about with all the books being read! Hah! Now I understand the comment that you left me earlier. I love that you posted all your photos right off the bat, and that you trusted we wouldn’t think you are completely crazy. *giggle* Hope you’re reading something that is totally tickling your reader’s fancy right now! I hope you guys are having a great day so far. I loved The Night Circus when I read it this summer. I’m readathoning! And it looks like you have some pretty awesome books to choose from! Awesome book list! Keep on readin’!!!!! I’m so happy you all are taking part! I’m not able to this time but maybe next time. Happy reading! I love that you are re-reading “Stardust”…one of my favorites. I need to do a re-read too. I haven’t seen the movie in forever either! Thanks for visiting me this read-a-thon. Happy Reading! Sounds like you’re all reading up a storm! How fun that you’ve made a family event out of it. I keep trying to get my mom to join me, but I never seem to have any luck with that. I’m pretty jealous of your book piles – lots of stuff I want to read on them! Wow, I’m impressed! I don’t know how you people manage to read (and, in your case, cheerlead — BTW thank you for visiting my blog!) so much in so little time! Well done! Wow. A whole family event. That sounds like fun! I suppose I could read aloud to my cats and see if that makes it seem all family-like. 😉 Good job keeping track of your “cheering” comments. I have no idea how many I’ve left…Probably around 30, though, given where I am on the list of bloggers! Next time, I’ll keep track like you. 😉 It makes the time used feel more valuable! It’s great that a bunch of your family is reading with you. My mom read for a bit with me last October, but was busy with errands and knitting today. Wow! That’s a lot of reading going on at your house! Good for you all. iCarly marathon sounds like my afternoon, but not today! Didn’t know we have much in common! I changed majors 5 times and finally graduated psychology and, like you, act as if it didn’t exist. Thanks for cheering me on, Vasilly! Happy reading some more! You all rock! I can’t wait to see what the family total works out to at the end of the day: it’s already very impressive indeed! Still reading? Need coffee? Hang in there, it’s hour 19! I ended up reading 476 pages. Not too shabby, I guess. Not to shabby at all, Heather! Sounds like you had a great time Vasilly 🙂 My daughter and I like to watch iCarly too.